We have this question pop up frequently in our support group. What is mosaicism? On a very basic level, genetic mosaicism means a person has mixture of cells with different genetic make up. LFS Mosaics have some cells that have Tp53 mutations and some cells that do not, where as someone who inherits LFS from a parent will have mutations in all of their cells. Theoretically since mosaics do not have mutations in all of their cells, the cells that do not have mutant p53 are less likely to go rogue and turn into cancer or have the same risk of everyone else. LFS is a dominant trait, which means that it is the trait we see, it kind of overpowers the other gene. If a parent carries the gene there is a 50:50 chance of passing along LFS to their children. But remember, it’s like flipping a coin- a person with LFS could have all of their children with LFS, none of their children with LFS or a mix. Each person has 23 pairs of chromosomes- just like the Ark- chromosomes travel 2 by 2- one comes from a mother and one comes from a father. This article, DNA Double Take in the New York Times explains some of the complexity of DNA, of which mosaicism is a big issue. Sometimes cells in a parent’s reproductive organs are mutated. So when that parent has children, the mutation could be passed along. The parent may not have any history of cancer and no way of knowing they have mutated cells. Depending on the situation and location of mosaic cells, multiple children in a family could be affected. It is not unusual for siblings of a child with mosaicism to be tested, even if the parents test negative for LFS. Sometimes in the journey to finding out about mutations and heredity, there are uncomfortable questions of possible parentage of a child. It’s not fun to answer questions like that, but it’s not personal- it’s kind of like an investigation- leave no stone unturned. Other times during pregnancy, the embryo is mutated at very early stages of development and only certain cells then develop with the mutation. Just like there are many events that lead to mutations that turn into cancer, there are several different events that could lead to mosaicism. 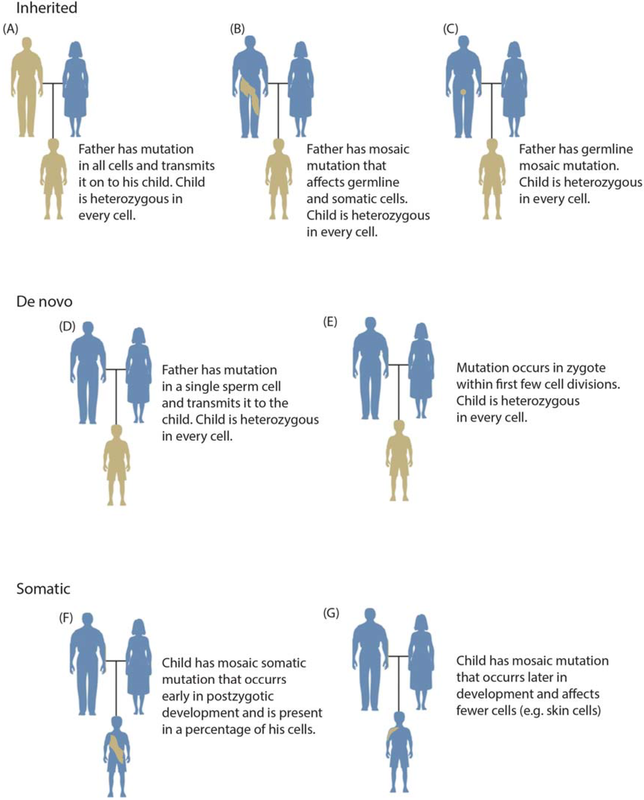 The diagram below is a good example of some of the ways mutations can be inherited. Mosaicism is thought to be very rare. Considering LFS is rare- that makes it rare of rare. If you were tested for a TP53 mutation and it came back positive, you have LFS and the mutation is present in all of your cells. According to an article in The Scientist Magazine last summer, we are all a little bit mosaic and have a mixture of DNA in various tissues, for example male DNA in a woman’s brain tissue, an example of how mothers carry some of their sons’ DNA with them always. This article questioned whether or not mosaicism was really as rare as we think it is, or if it rather was the beginning of an evolutionary adaptation. You can read the article here. Further research is needed to understand what the frequency of mosaicism is, when mutations are inherited this way and why some are not. If you have certain cancer types that are considered LFS core cancers and other criteria for having LFS but no mutations that are known, you might be mosaic, you might have Li-Fraumeni Like Syndrome, or you could have a mutation that isn’t known. Many cases of mosaicism are found when children are diagnosed with one or multiple LFS cancers that have TP53 mutations in the tumor, yet test negative for germline mutations. The best thing to do is talk with a Genetic Counselor about your history and risk. They are trained to help you understand and interpret test results and they are a wonderful resource for those with LFS or with a family history of LFS. A doctor can refer you to genetic counseling or counselors in your area can be found HERE. If you have suspected Mosaicism, it’s a good idea to discuss a screening regimen with your team of medical professionals. Many have had to answer the awkward question of- are you sure you are both the parents of the child. One of the tricky parts of LFS is not knowing where cancer might pop up or when. With mosaicism, you may be able to get a better idea of which tissues have mutations and those areas should be monitored because we don’t know how much higher the risk of cancer developing there is or if it is higher than for the average person. Again, a Genetic Counselor is an excellent resource in helping to tailor a screening routine that is appropriate. Mosaicism is just one part of the bigger picture of our individual genetics that researchers know will give them a better understanding of how LFS is inherited and how cancer develops, but we just don’t know right now. There isn’t a simple answer and no simple way of determining which tissues are at risk. Li-Fraumeni Syndrome can be frustrating. There are so many parts of the disease and the mutations that are just not understood yet. Some day we will hopefully be able to predict which cancers are linked to certain mutations and then even prevent cancer from forming . One day living with LFS might mean focusing on prevention more than treatment of cancer, no matter if some or all of your cells have the mutation. Somatic TP53 mutation mosaicism in a patient with Li-Fraumeni syndrome.